Observance of our Lord's Supper is on the first Sunday of the quarter in January, July and October and on Palm Sunday (March or April) during our Morning Worship service. All believers in Jesus Christ are invited to participate. Our deacons are caring, serving men who love the Lord and our church family. They are elected by the congregation for three-year terms. Our facilities include a sanctuary (built around 1933, with original tin ceiling and light fixtures) which seats approximately 125 persons; nine classrooms; a fellowship area with kitchen; and a church office. 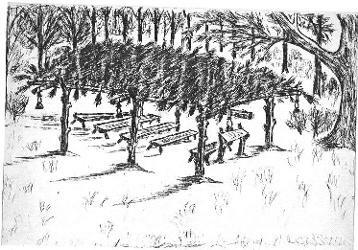 A memory garden, screened picnic pavilion, and athletic field are also located on the nine acre property. The Ward's Grove Cemetery is located adjacent to the church property. Although we are located in a rural area, with crop fields surrounding us, our membership has shifted from agricultural-based to professional and suburban. We are affiliated with the Madison-Chester Association of Baptists, the Tennessee Baptist Convention, and the Southern Baptist Convention. We hold to the Baptist Faith & Message of the Southern Baptist Convention; it can be viewed at www.sbc.net/bfm. The Baptists in the Claybrook vicinity of Madison County had established a church called Oak Grove on Law Road, four miles north of its juncture with the later State Highway 20 (date unknown). Its membership had dwindled so much that the congregation disbanded in the 1880s, although the small cemetery there was used for many years. The Reverend B.F. Bartles from Chattanooga was brought in to the community to help organize another Baptist congregation in October 1885; the meetings were held briefly in the blacksmith's shop in Claybrook. Earlier that month, they even asked the Cumberland Presbyterians if they might use their meetinghouse in which to organize. The Bethlehem Cumberland Presbyterian elders replied to their Baptist "brethren" that they might hold services in their house of worship if it did not interfere with their regular services and other activities. The efforts to organize another Baptist church failed at that time. In 1908, a brush arbor revival was held in the community some three miles north of Claybrook. The revival was held by two sons of Thomas Day Ward: William T. Ward and Marion Eli Ward. The local Baptists then organized themselves as Ward's Grove Baptist Church. Dr. John Hicks Lanier donated one acre of land to this group as a place upon which to build their new church-house, a frame building, on September 18, 1908. A one-acre cemetery lot was acquired from W.H. Gowan and wife for $60, paid by Miss Alice Lanier on June 26, 1916. Thus began the Ward's Grove Baptist Church Cemetery, which is located adjacent to the property to the south. The original frame church was destroyed by a tornado on Mother's Day, the second Sunday in May, 1932. Its successor was also frame and was rebuilt under the supervision of church member Mr. or "Uncle" Clyde Boswell. Much of this construction, such as the tin ceiling and the banisters around the pulpit, are still part of the sanctuary. Numerous additions have been made to the original building: classrooms were added to the back of the choir area and the basement; later, a classroom was added to each side of the building. The frame structure was then bricked. In 1975, a new addition consisting of a fellowship hall, classrooms, nursery, kitchen, baptistery, and restrooms were added. The last of the additions was made around 1990, which consisted of more classrooms, restrooms, and storage area; and a beautiful memory garden made possible by a donation from the children of the late Johnny and Pauline O'Brien. The earliest know pastor was Bro. A.L. Balis, who was pastor in 1918. Others who are known to have served were Hersey Hopper, J.S. Bell, and Bro. Moody in the 1920s and early 1930s. The much beloved Bro. Kester Cotton became the pastor in the late 1930s and remained until the late 1940s. Bro. Cotton was followed by Bro. Burll Burress, who served until the early 1950s. From the 1950s through the 1970s there was a period of many pastors, many of whom were students at Union University in Jackson preparing for ministry, including Bro. Banks, Bro. Evans, and Bro. Carneal Thedford, who pastored 1959 to 1962. Although Bro. Thedford was a student at the time, much growth took place in the church and the church became full time during his ministry; prior to that, services were held only twice a month. Other pastors during this time were Bro. Tillman Mays, Bro. Pruitte, Bro. Charles Timberlake, and Bro. Jerry Smothers. Around 1970, Bro. Kester Cotton was again called to lead the church and it was during this pastorate that many changes occurred. New deacons were added, building improvements were made, and membership grew. Michael Taylor was hired as the first youth director in 1979. Bro. Cotton remained until January 1982. Upon his retirement, Bro. Daryl Watson was called as interim pastor and served until Dr. Matt Tomlin was called as pastor in 1984. In 1983 Bro. Prince was hired as an associate pastor. Dr. Tomlin served the longest tenure so far at Ward's Grove, retiring in January 2009. Bro. Bob Eliot served as interim pastor for one year, then Bro. Ken Skelton was called as pastor in April 2010.